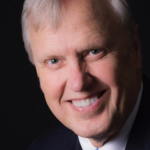 Stan Engebretson is the Director of Choral Studies and Professor of Music at George Mason University, the Artistic Director of the National Philharmonic Chorale, and Director of Music at The New York Avenue Presbyterian Church (aka the “Lincoln” church) in Washington, DC. He earned bachelor’s and master’s degrees in piano and voice from the University of North Dakota and his Doctor of Musical Arts in Conducting from Stanford University. A frequent guest conductor and clinician, Engebretson has appeared throughout the United States and abroad in Germany, Switzerland, Italy, France, Russia, Lithuania, Cuba, South Korea, and Iceland. Through advanced study grants he had the opportunity to work with the great choral mentors of our time, including Eric Ericson, Robert Shaw, Gregg Smith, Richard Westenburg, Roger Wagner, and Margaret Hillis. As a lecturer, he has served as Fulbright Foundation Senior Specialist in Iceland, and speaks annually for the Smithsonian Institution in events such as Spoleto USA.